Methane SIBO – Can I Heal My Gut? Are my symptoms conducive to Methane SIBO? Well, after having a breath test which showed only a slight elevation, I was told no you do not have SIBO, but recently I came across some information that made me think again, that SIBO could be my problem. About three weeks ago, I started a FODMAP diet. I did this along with an anti-SIBO anti-fungal herbal protocol. Even though I had been tested for SIBO using a Lactolose breath test, which had come back clear, I still couldn’t stop thinking that my symptoms were synonymous with this condition. Then after reading an article which pointed out that there are different types of SIBO, with methane producing archaea being the most likely cause as I am constipated most of the time. Another blog I came upon mentions sulphur smelling burps as another symptom. This information cemented my reasoning as recently I had another attempt at probiotics but had a a bout of sulphur smelling burps soon afterwards. Although I do not get the sulphur smell after eating high thiol or sulphur containing foods such as eggs and broccoli etc. 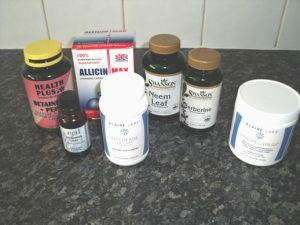 The specific path I followed was to take Interfase about 25 minutes before eating, then two tablets each of NEEM, Berberine and Allicen with each meal. With breakfast I also so took half a teaspoon of VITASPECTRUM. I ate just three meals per day with no snacks. The Betaine was for high protein meals. I gathered a war chest of supplements and got my grocery list ready for a FODMAP fest. After about seven days on this protocol, I experienced proper bowel movements at about an hour after every meal – this was fantastic – not done this in years. To my dismay, this was short lived, as I relapsed after I ate a few strawberries with some coconut milk. This immediately bloated me up and I was back to being constipated again. I continued for another week, but even upping my dosage of Iberogast and increasing 5-htp there was no major signs of symptom relief. I also experienced extreme fatigue. I initially put this down to die off, but as the malaise was relentless for two weeks, plus I was losing weight – which I could not afford to do, I figured there might be more to it. So, I added in to my diet Jasmine rice, and the occasional low fermentable potato. The addition of these starches did not stop the fatigue or increase my weight, even when I ate huge amounts. I had to go abroad for business at this point, so abandoned the anti-fungals, plus most of the restrictive low fodmap foods. I do always try to eat Paleo at least, where ever I go, but at restaurants it’s difficult.